The apartment Anna with pool in the garden is located in Cesarica in Karlobag directly on the sea or Beach. The apartment Anna is located in the basement of the house and can accommodate 8 people. The apartment has a kitchenette with dishwasher and a living room with pull-out sofa bed for two people and a large dining table for 8 people. Furthermore, the apartment has 3 bedrooms for 2 persons and satellite TV in each bedroom. Each bedroom has a bathroom with shower. 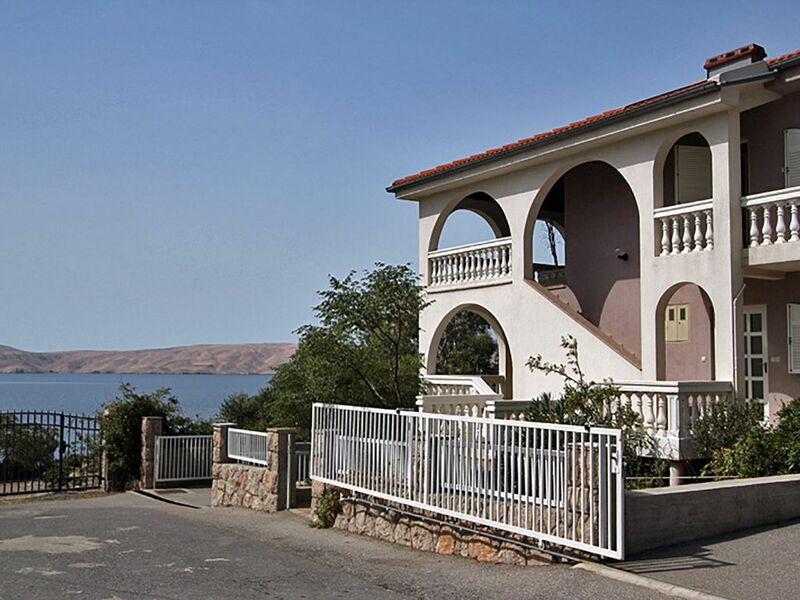 In the garden is a large covered terrace with incomparable views of the sea and the island of Pag. In the ground (half) - and upper floor of the house is the apartment Ika and Mario. Air conditioning, washing machine, bed linen, towels, coffee maker, dishes etc and all accessories for a pleasant holiday is available. Of course, the garden is at your disposal for use. There you can enjoy the Mediterranean sunsets, linger and relax during the barbecue. Internet is available and included in the price. The beach is accessed directly from the garden via a staircase. The center of Karlobag is about 6 km away from the house, where you will find several shops, bars, cafes, bank, post office, etc. In addition, on-site boat trips to the nearby islands, hiking and climbing in the Velebit mountains with an experienced guide or diving courses are offered. In addition, hiking and mountain biking in the Velebit and Paklenica National Park, visit to the unique world heritage Plitvice Lakes, great boat trips to the nearby islands of Rab and Pag and much more. Visiting the nearly 30,000 square meter nature reserve Plitvice Lakes is an unforgettable experience. The Plitvice Lakes are equipped with beautiful walking paths, so they can be visited in any season due to the beautiful nature and access to the lakes. About 30 minutes by car from the holiday home is located in the national park Velebit in beautiful landscape of the amusement park Rizvan City. The offer includes: paintball, climbing wall, high ropes course, archery, quad biking, jeep safari, climbing in Velebit, rafting, and much more. Especially for groups or families with young people the Adventure Park is the perfect destination for your seaside holiday. The apartment Anna is located in Cesarica in Karlobag in a quiet location right on the beach. In the house are the apartments Anna, Ika and Mario - the pool is available to guests from the three apartments of the house. The beauty of Croatia will make you forget your everyday life quickly. Because of its large number of islands and bays, this coastal strip is a little paradise especially for divers and holidaymakers with boats. Wohnung mega schön, der Eigentümer super nett und jederzeit für die Gäste da. Er ist immer zu erreichen und steht immer mit Rat und Tat zur Verfügung. Cesarica selbst ist sehr sehr ruhig. Wer also eher Aktion will, sollte sich einen anderen Urlaubsort suchen. Einkaufsmöglichkeit ist sehr weit entfernt. d.h. in Karlobag selbst gibt es 2 Supermärkte, die aber eher ein kleines überteuertes Sortiment anbieten. Um richtig einkaufen zu können, muss man nach Gospic, was fast 40 km entfernt ist. Hier findet man einen Lidl und auch einen dm. Achtung beim Essengehen in Karlobag, die Restaurants in Riberica und Karlobag direkt an der Straße (mit Anker-Emblem) sind die reinsten Abzockerläden. Traumhafter Urlaub mit sehr, sehr netten und aufmerksamen Gastgebern. Die Unterkunft so wie beschrieben und auf den Fotos zu sehen, die Angaben stimmen mit dem vor Ort Überein. The apartment Anna is located in Cesarica near Karlobag directly on the beach. The beauty of Croatia will make you forget your everyday life quickly. Because of its large number of islands and bays, this coastal strip is a little paradise especially for divers and holidaymakers with boats. The center of Karlobag is about 6 km away from the house, where you will find several small markets, bars, cafes, bank, post office, etc. There is also the possibility of boat trips to the nearby islands of Rab and Pag or hiking and climbing in the Velebit mountains with an experienced mountain guide. The crystal clear and clean waters of this stretch of coastline in Croatia are a paradise for snorkeling and diving guests. Karlobag is also surrounded by 4 national parks, the islands of Pag and Rab, the coastal cities of Zadar or Senj and the sacred mountains of Croatia, Velebit. Furthermore, there are great boat trips to the nearby islands of Rab and Pag, hiking, guided mountain tours in jeep and mountain biking in the national park Velebit and Paklenica and much more. Other worth seeing destinations are the Krka waterfalls and the Kornati islands. Die Klimaanlage ist nicht im Preis inkludiert und wird vor Ort bei Benützung extra vom Eigentümer verrechnet. ( € 5.- pro Nächtigung). Kurtaxe ist extra vor Ort zu entrichten.